Sprint is reportedly preparing to launch 'One Up', an early upgrade program that would let its customers pay for the devices in monthly installments and upgrade each year by trading in their existing device, reports CNET. Sprint will be the last major U.S. carrier to offer an early upgrade program. T-Mobile has Jump, AT&T has NEXT, and Verizon has Edge. 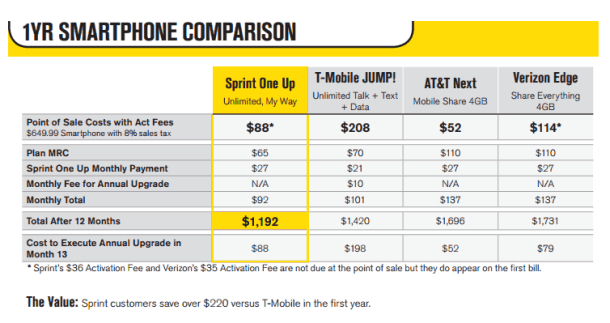 Sprint's One Up lets customers pick up a phone with no money down and pay for the device in 24 monthly installments. A phone that costs $649.99, for instance, will cost $27 a month (with the difference tacked on to the 24th payment). If a customer leaves the service early, that person is on the hook for the balance of the device cost, due the following month. After a year, a customer can upgrade to a new phone by trading in the device. One Up will be available to customers on Unlimited, My Way or All-In plans. It will reportedly provide a $15 discount which brings Sprint's unlimited talk, text, and data plan down to $65/month. One Up is set to launch on September 20.